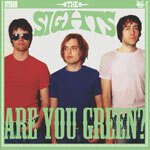 Sorted magAZine: The Sights - Are you green? Had they not been forced to cancel their UK tour, this re-release of The Sights' debut album would have been perfectly timed. Originally released in 1999 on Spectator Records, it sounds like it could have just as easily been released in the 1960s. It's chock full of old school rock sounds, piano and organ vibes and vocal harmonies. This album is a time machine, but what you've got to wonder is, is it a good one or is there even a need for it? At times, yes, it hits the mark, like on 'Sorry' where the organ squeals alongside the droning, guitar perfectly or on 'F#', but then on 'I can't stand you' they attempt to become the Rolling Stones. Instead, they come across like The Datuns. And I can't stand The Datsuns. The psychedelic drilling of the ultra-weird title track sounds interesting to begin with, but quickly loses the plot. Generally, I have little time for this type of modern retro rock and I don't think The Sights are going to change my mind, or anyone else's for that matter. There are too many poor moments, 'Not one to beg' and 'She's not the one' are both very weak tracks. If you want to listen to cheerful melodies and bright guitars, then listen to The Beach Boys, The Thrills, Supergrass or The Blondes. Each of those bands will do more for you than this band ever will.